Contemporary YA has always been my favorite genre. Sarah Dessen is really the author that got me into reading. My blog would not exist without her books so I figure this is the perfect way to honor those books! So for the third year, I will be hosting the YA Contemporary Challenge and this year I have a new co-host, Montana from The Book Belles. I wouldn’t be doing this without her help! I have created a Goodreads group for the challenge. Included in the group is a shelf where I have added and will continue to add contemporary YA books being published in 2014. Members of the group can also add books if they are missing. 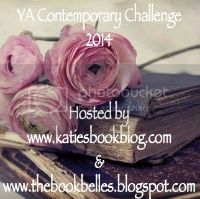 If you have a contemporary YA book coming out in 2014 I would love it if you would participate. I would love it if you would be interested in donating swag/books or being featured here on Katie’s Book Blog or over on The Book Belles. If you are interested, email me at katieb206 at gmail dot com or Montana at bookbelles at gmail dot com. Anyone who has a blog or a Goodreads where they can post reviews is eligible to participate. Contemporary YA is an awesome genre. Isn’t that enough of a reason? Create a list on your blog or Goodreads with your list of books. You can create a list of books that you want to read or start a blank list and add the books as you read them. Once you have created your list come back here and add it to the linky below! Make sure that you post it on the same blog/Goodreads that you are going to post your reviews on throughout the year. Sign-ups end May 1, 2014. Am loving this challenge so far, thank you! Hey, I know I’m a bit late, but I was wondering if I could still join. This is the blog I’ll be talking about and listing the books in. Sure! The linky is already closed but feel free to enter the giveaways each month when they go up and just link to your reviews then! Why do the books have to be published in 2014? I have contemporary books from every year that need to be read. I would consider joining this challenge more if we could just read contemporary books published in any year. The goal of this challenge is to bring some attention to new contemporary releases, a lot of which are debuts so people sometimes miss out on those. I’m sorry that you would like it to include previous years releases but for now that’s not how it works. I’ll take your idea into consideration when I plan for next years challenge. I just found this challenge today, and I’m bummed that I missed the linky sign up. However, I think that I will still do this challenge since I am a huge fan of YA contemps and would love to read some of the new releases this year!